The margin of error for a specific result for a specific sample size. For example if you surveyed 100 people out of a total population of 100,000 and 85% said they did like chocolate then the margin of error is 7% at a confidence level of 95%, which means that if you repeated the survey enough times within the same population then 95% of the time you would get an answer between 78% and 92%. 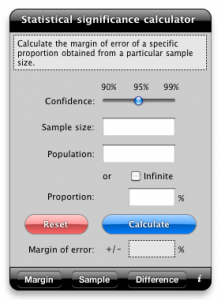 The sample size needed to obtain a specific margin of error for a specific result. For example, if you have a population of 500 people and you want to know how many agree with a question to within 5% either way and you suspect the around 40% will agree then the sample size needed is 212, with the same restriction as above on this being only 95% likely. If you do not have any idea how many will agree with the question then use 50% as that gives the highest figure, to be on the safe side. Whether the difference in two results is statistically significant or not. If you conduct two surveys and in one 35% of 2,000 people (from an infinite population) agree with you and in the other 42% of 85 people agree with you then is this difference significant or not? In this case it isn’t. If ztest > z where z is chosen from the confidence slider then the difference is significant. in the difference analysis part, i was not able to find “significant difference” cases. i have my doubts and you will understand. It does look as though that code is no longer working. I’m not sure what version of OSX that stopped working with. Unfortunately the Apple development tools for widgets are pretty old so I’m not sure if I can fix this.